Although you may already feel overwhelmed by the growing number of social media sites, free micro-blogging platform Tumblr can be a powerful tool for spreading awareness about your brand. Founded in 2007 by David Karp, Tumblr serves both as a blog and social network that's useful for posting and sharing images, video, audio or short pieces of writing. In that sense, Tumblr is a bit like Facebook -- but with a few advantages. For instance, Tumblr blogs can be accessed directly via the Web, whereas Facebook content is available only to its users. That means Tumblr content gets indexed by search engines and can increase your search visibility. Tumblr also offers many free and premium blog designs, and is one of the most mobile-friendly publishing platforms. If you use both Tumblr and Facebook for your business, you can integrate Tumblr posts into your Facebook timeline. Tumblr says it hosts nearly 65 million blogs, garnering nearly 17 billion page views per month. In terms of engagement, Tumblr is second only to Facebook when it comes to the average amount of time users spend on the site. So, is Tumblr is a good match for your business? According to internet analytics service comScore, 50 percent of Tumblr users are age 25 or younger. So if your business targets the youth market, it should be worth a shot. But even if young people aren't your core market, Tumblr's search visibility benefits, mobile friendliness, and popularity should make it worthwhile to at least experiment with. If you're accustomed to conventional blogging tools such as WordPress, Tumblr may feel limiting at first, especially if you're trying to publish longer articles. It also has its own idiosyncrasies for "liking" and sharing content. You'll create your first Tumblr blog when you set up your Tumblr account. This will become your default blog, and it's somewhat complicated to delete. So use care in creating it, and choose a name that's based on your personal, business or brand name. There are a number of online resources for working out some of the details about using and navigating your Tumblr blog. A site called Unnecessary Ligatures recently published a useful starter kit. Tumblr also offers a handy reference with user tips. Follow, "like" and reblog often. In any social media, listening and curating are key to engaging your followers. You can search Tumblr for posts on topics related to you or your business, see who publishes the most important, popular or engaging items on those topics, and follow them. Take a few minutes each day to "like" or reply to Tumblr posts from other people. Also, share their posts (called "reblogging" on Tumblr), which will put them on your Tumblr blog with attribution. And experiment with posting different types of content: links to interesting stuff you find online, your own photos or videos, brief written observations or tips, and more. Aim to reblog others' posts -- or create your own new posts -- three to five items per day, three to five days per week. That may sound like a lot, but posting can be fast and simple. On your computer, install the Tumblr "bookmarklet" in your Web browser. 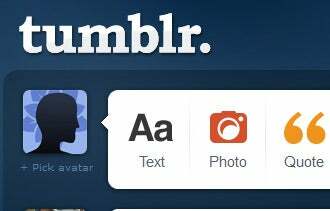 Then, you can click the Tumblr button in your browser toolbar to quickly create a Tumblr post about any Web page you view, without having to log in to Tumblr or copy or paste anything. Also, install Tumblr's mobile app on your smartphone or tablet. Then, Tumblr will automatically show up as an option whenever you select "share" from any content item in most other apps, such as YouTube, your mobile Web browser or your photo gallery. If you use the popular photo-sharing service Instagram, configure it so that you can easily cross-post photos from there to your Tumblr blog. A key way that Tumblr users discover each other is by the tags they append to posts. For instance, an architect in Boulder, Colo., migth want to track the tags "Boulder," "Colorado," "architecture" and "home building" -- as well as perhaps "green design," "sustainability," "energy efficiency" and other specialty topics. Pay attention to the tags used on the most popular Tumblr posts for topics that interest you. You can save those searches ("tracking" those tags) so you can easily see the latest posts, even if you don't follow those users. Where relevant, tag your posts using those same tags. This can make it easy for others who are already tracking those tags to discover your posts. Taking a few moments to tag each Tumblr post may seem tedious, but this can help expand your network quickly. Tumblr offers other useful features, such as monitoring and analyzing traffic to your Tumblr blog with Google Analytics. Also, you can apply a custom domain name to a Tumblr blog, meaning you can use Tumblr as the primary website or blog for your business. Using a custom domain name can improve the search visibility of your Tumblr blog. If you have an existing website that isn't easy for mobile users to load or navigate and you don't have the resources or time to optimize your site for mobile visitors, consider using a Tumblr blog as a special digital presence that will serve your mobile visitors well. Tumblr doesn't directly support commenting, but you can easily add this feature by integrating the free tool Disqus. You can also create as many Tumblr blogs as you like from your account. If you're involved in an event, such as a film festival or conference, or if you want to build awareness of a timely topic, you can create a special-purpose Tumblr blog that you add content to for a limited time. After its moment has passed, you can either delete that blog or let it remain online as a record.